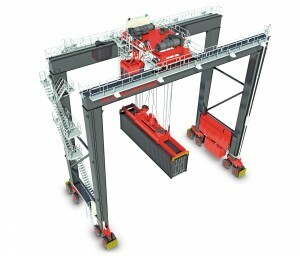 The name of Konecranes is not new when it comes to the industry of Gantry Crane. 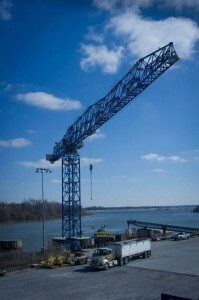 These cranes have been considered to be the most powerful and durable cranes in today’s world. This is also quite true because the Gantry Crane is considered to be excellent for assembly cells. Now the world has even much to appreciate for Konecranes has been able to launch a new series, with a wide number of models. According to the Chairman of the Konecranes, the new series with its many models have been produced to cater to the rising demand in the industry for excellent electric chain cranes. It has been established by Konecranes that the newly developed models have a wide number of different advantages, which include the fact that they are 25% faster, along with the fact that they are more powerful than ever. Furthermore, the service life of the new series is four times more extended than the previous series. The electric chain hoists are able to work as standalone applications as well in the case of assembly cells within the processing industry. However, they can work as workstation and Gantry Cranes, as well. Therefore, you would find the new series to be quite flexible. The Konecranes representative has also announced that there are three models within the new series but there will be even more versions to come. The models include the CLXO2, which can lift up to 63 to 320 kilograms. On the other hand, the second version titled CLX05 can lift up to 250 to 630 kg. In addition, the CLX10 has the lifting capacity of around 1000 to 2500 kilograms. It has also been stated that the newer models would be able to take the lifting capacity up to 5000 kilograms. Furthermore, these Gantry Cranes are made from solid steel structure, which means that they are able to lift heavier loads than ever before. The lift chain has a longer service life, because of the patented chain wheel that has been made. The drive system of the wheel made up of chain has a drive system that is oil-lubricated which paves the way for excellent power transmission. In addition, it is able to give a speed ratio of 6:1. This ensures that these models are quite fast. It has also been firmly stated by the company that the safety standard has been maintained with these chain hoists. The safety clutch and the brake have been designed in such a way that in the situation that the clutch fails to operate, then the load would be stopped from falling. Users would also find the fact that the CLX series is easier to maintain an added advantage. The company has made it clear that the components of these Gantry Cranes are easily made available in the market. Now the users are simply excited to hear more about the new models in the series of Gantry Crane which would take the loading and unloading to another level altogether! How to Assemble & Use the Tower Cranes? Cranes are used for construction purpose. The high rise tower cranes have attracted the people and are migrated to Dubai for sky-scrapers. It is a kind of feat of construction engineering. Tower cranes are eighty meters long and can perform overwhelming tasks without problems. The “moment” is the basic engineering principal that supports the tower cranes from slanting over. If the weight is attached to the jib arm of crane torque or rotational power is exerted. The direction and amount of power “clock wise or anti-clock wise” is known as moment. Contrary to this, if the weight is attached to the mast, the amount of moment is less as compared to weight on jib. When the crane gets its highest position, it can easily tether to constructive area and use to build the highest buildings. One of the astonishing and extraordinary achievements of tower cranes is literally constructive structure. The assistance from a mobile crane, the workers get a protected position and put together the top most unit or tower crane-jib, machinery on and slewing unit. Before attaching the top most section, a hydraulic unit for mountaineering is used around the bottom of the crane (Operator cap and horizontal jib) to slide in the next section. As long as the new segment is secured, the workers use the hydraulic unit to climb up. The crane is built section by section itself with a slow or secured procedure. Hook and trolley are linked by cables to the motor of trolley which is positioned on the top most Jib arm. The operator is able to roll back the trolley by hand control. The horizontal arm of tower crane is capable to maximize 85 meters outward. There are 3 sides of the arm. The tower has 2.8 meter long sides. The four sides have diagonal, horizontal and vertical trusses to provide structural unity. The power to lower and raise the load is offered by a winch. It is positioned with the machinery arm or counterweight Jib. The outside unit is affixed through hydraulic unit. The top section is lifted by a hydraulic arm to include latest sections below. The tower cranes achieved stability by burying the tower in concrete which is weighted 185 tons. It permits the Jib arm to move around 360 degrees to drop and lift the material around the construction area. There are different concrete slabs which have tons of weight and are attached with counterweight jib to over-compensate the holding capacity. Tower cranes can be given on rent or lease for completion of projects. The safety precautions are provided to avoid damage or collapse. In case of complex building, the tower remains in place and becomes a long lasting part of the new building. As a result, the builder finishes the construction project and does not remove the tower from the completed project. 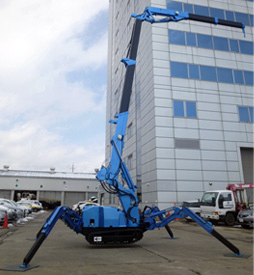 The GTC-1200 is by far the largest capacity Tadano Mantis crawler in its entire product range along with being the initial blank sheet design after the acquisition of Mantis by Tadano in the year 2008. Tadano mantis rocked the ConExpo 2014 through displaying the GR-1600XL-2 rough terrain, the ATF all terrain 400G-6 crane and the hyped GTC-1200 telescopic boom crawler crane models. According to the vice president of customer support and sales, Ed Hisrich, the Tadano Group of Companies through utilizing global synergies of the group has brought forward a new design towards completion thus presenting before the world the strongest and best crane by the company to date. The concept that drove GT-1200’s development was the designing and building of a telescopic boom crawler that was able to meet the growing requirements of the Tadano Mantis’ central markets of foundation construction, bridge and civil and power transmission. The idea also extended towards expanding the wider crane appeal of lift crane founded markets. The design of GTC-1200 was managed by the engineering team of Tadano Mantis in Franklin, Tennessee. However its make is a collaboration of Tadano Gmbh and Tadano Ltd engineering teams. The machine utilizes also the strengths and core competencies of the group within itself. The GTC-1200 is a step forward in Tadano Mantis design, offering a two extension mode, round boom, the AML-C Tadano load moment system, telematics of HELLO-NET and integration of winches, hydraulic cylinders and jib systems from other companies of Tadano Group. The full power boom of 42.1 ft – 155 ft (12.8 m – 47.2 m) 5 section was specifically designed for lift work performing along with being capable of pick and carry, out of level and foundation jobs. A job system compliments the man boom including a 3.8 m (12.5 ft) heavy lift jib with 44 tons of maximum capacity and is part of bi fold standard jib with lengths of 33.9 ft/ 59 ft (10.3 m/18 m). An optional 7 m (23 ft) lattice insert of maximum 2 sections is also available. The job system in full can offset 0 degrees, 20 degrees and 40 degrees, while the maximum tip height when fully erected is of 82 m or 269 ft. The Cummins Tier 4f, powers the GTC-1200 with a QSL9 diesel unit rated at providing 350 hp at an rpm of 2100. The power controlled system of hydraulics, senses loads and increases the output of the hydraulic to the output of the diesel engine power for efficient control and operation. A detached closed loop hydrostatic transmission controls the swing system for superior performance. The 2 speed track drives offers max speeds of 2.6 km/h or 1.6 mph with the unladen maximum gradability reaching 52%. The overall transport configured height of the machine rests at 11 ft 10 inches (3.6 meters) whereas in the working configuration, the height of the vehicle rests at 14 ft 9 inches (4.5 meters, while the gross mass of the vehicle states 115,666 kg or 255,000 lbs. Explorer 5600 is the name of the new addition in the Terex’s Explorer family of all terrain cranes. The AT five axle, 180 ton machine was designed primarily for road ability. #.9 ft is the only extension space of the boom over the front and a boom off optional solution or the dolly option facilitates the model in meeting up the stringent standards of the road. The automatic rigging counterweight system permits the crane t get ready instantly for work. The length of the carrier of Explorer 5600 is 41 ft which allows it to move and navigate easily through the urban and congested construction areas. Further on capability of tight cornering and cram steering are also offered by the all axle steering. The compact size of the 5600 in no way leaves behind productivity in any sense. With a maximum system length of 312 ft, main boom reaching 223 ft and load moment of maximum 480 mt makes the Explorer 5600 stand out among the strongest present lift charts in the whole capacity class of this working range. Explorer 5600 offers 38.5 tons of lifting capacity during telescoping and a hoist of 22,076 lb. ft, along with a rope of 21 mm and a cable pull of 10.9 ton that entails reduced reeving for enhanced performance and shorter times of rigging. The explorer 5600 comes with a power management system that offers best efficiency and performance for every load cycle to provide whenever required power and economy of fuel when the upper structure of the crane is operated. Not only does this reduce the maintenance of the components with service requirements but the positioning of the gearbox and engine are also done in a centralized area in order to reduce service time. A new enhanced electrical braking performance system is given to Explorer 5600 that offers reduced brake pad wear, while the driver’s upward hill drive is supported by the dynamic launch control. Terex crane equipments are known for safety being their paramount feature and same is the case with the Explorer 5600. Access to cabs on the upper structure along with reaching upper components is made easier than ever before with multiple egress and access points. The 26.7 ft X 24.6 ft outrigger base offers stable and smooth operations during load lifting. The package of working lights provided with the Explorer 5600 offers exceptional visibility of the site at night owing to the xenon working lights package which is optional along with other optional features including the pendulum load camera, the right hand and hoist cameras and tail swing cameras. Terex’s Explorer 5600 comes equipped with IC-1 control system, which is a proven intuitive and efficient touch screen system as standard. All radius and loads input can be used by the IC-1 software system to configure and load charts as required enabling the operator to instantly meet the settings and requirements of a job site. Also the touch controller displays information about ten different working variables such as tire pressure, suspension system, axle load, status of brake system, etc. 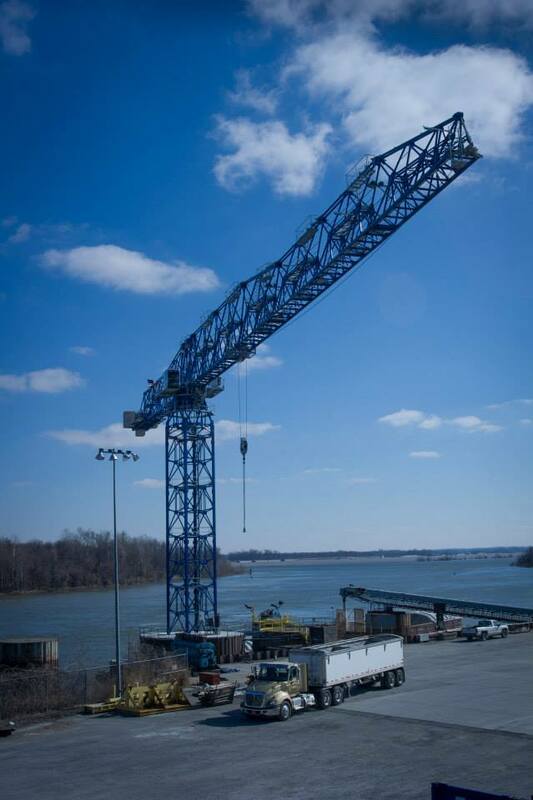 The new 30LC1450 Linden Comansa tower crane has been delivered to the Riverport authority in Paducah McCracken County, Riverport in Kentucky, USA. The crane is said to be North America’s largest tower crane with a flat top provided by Pineville, North Carolina’s company Linden Comansa. The basic aim of this delivery was to facilitate the increasing traffic at the port situated at the Tennessee River. With Panama Canal’s expansion, increased port traffic was experienced having its strong impacts on the shipping industry worldwide. Riverport dock offers a couple of dock facilities that are competent in handling as much as three barges consisting of both general and bulk cargo. In the words of Riverport’s executive director, Ken Canter, having the world’s largest flat top tower feels quite impressive as North America is now ready to handle and serve incoming traffic to Riverport’s port. Not only is the tower a base of pride but it will also offer enhanced market capabilities that will facilitate barge movements to Ohio valley. The port received the Linden Comansa 30LC1450 on the 17th of January, 2014 and its successful installation completed on the 9th of February amidst several challenges. Some of the major challenges faced during installation included high winds and sub zero temperatures. The capability of the Linden Comansa flat top tower crane can be well assessed by the experience of crane contractor’s that contributed in the installation process and the commissioning of the machine. They witnessed the world’s largest flat top crane moving 28.1 tons (62,000 pounds) of weight over a radius of 58 meters (191 feet). Besides its main feature of moving excessive weights to a wide radius, the machine also offers additional features. These features includes fitted work lights, panoramic extra large cab to enjoy a much better work view of both the area and the load, the prohibited zones function and enough space in the cab for an air handling unit, a small refrigerator and room for storing a small appliance. The 30LC1450 has a capacity of 48 tons operated on a 200kW hoist motor while the maximum speed during loading full capacity is 21 meters a minute. The hook height stands at 22.8 meter while the jib length equals 60 meters. The world’s largest flat top tower crane can be configured in capacities of either 32 tons or 64 tons. The new machine will be joining the former Linden 8000 flat top tower crane which has been serving the port for the last 40 years. The Linden 8000 handles all Tennessee River banks freight whether incoming or outgoing at the meeting point of the Tennessee and Ohio rivers. The Linden 8000 has been refurbished once in 1990 to facilitate its services. Although both flat top tower cranes are working on the port, however the technology difference between 8000 and 30LC1450 is immense. The 30LC1450’s digital readouts of weights, radius and wind are displayed clearly for the operators to properly function all operations. Also much lesser electricity is consumed with the given frequency drives of trolley, slewing and hoisting movements. The MK1033 is the latest and updated version of mini cranes revealed by Maeda in the ConExpo show. 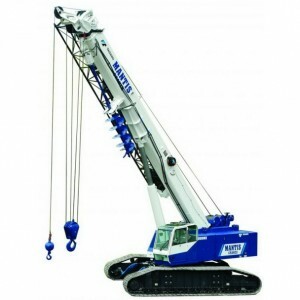 The mini crane comes fitted with an articulating boom. According to Maeda USA, Houston Texas’ president, Tony Inman, the MK1033 may be the only articulating knuckle boom mini crane available in the market today. While the model has been introduced last year in the 2013 Bauma Show to Europe, however it reached the North American market this spring via the ConExpo Las Vegas, Nevada show where it was revealed. The production models are expected to hit the North American market sometime later this year according to the president of the Maeda, USA. What makes MK 1033 stand out between other models of this genre, is its knuckle boom mini crane ability, which allows it to work in rather complex spaces, reaching out over objects combined with its maneuverability and compactness. This mini crane with articulating boom is said to be exceptionally useful for jobs such as glass installation, renovation or maintenance of factories, petrochemical factory working, housing construction work and several other types of tight quarter jobs. The MK1033 is able to lift a maximum weight of 2,190 lbs at a radius of 3 ft 4 inches, whereas it can lift that load to up to 23 ft 11 inches of height. The maximum tip height of the MK1033 reaches 37 ft 5 inches and it can lift up a weight of 1,388 lbs to its maximum height. Given the horizontal placed articulating top section of the boom, the MK1033 can reach a height of 23 ft 11 inches, lifting 573 lbs at a radius of 15 ft 7 inches. With a horizontally laid out, straight boom, this crane model can travel a radius of 31 ft 8 inches lifting 400 lbs of weight. With measurements of 2 ft 4 inches in width, 8 ft 11 inches in length and 6 ft 6 inches in height when stowed, fitting through a single standard doorway is no problem for the MK1033. This crane is able to fit into some real tight and complex spaces. With an excellent 7.3 psi of ground bearing pressure, MK1033 weighs only 4,410 lbs. is used to control operation as it provides abundant information to the operator. The MK1033 also has a tipping prevention device installed as standard with every vehicle. MK1033 does not come installed with a winch as standard however the option of having one is present. Having the winch allows lifting of 1,800 lbs or spooling of ample wire rope that is sufficient to pick loads from as far as 213 ft beneath the crawler. 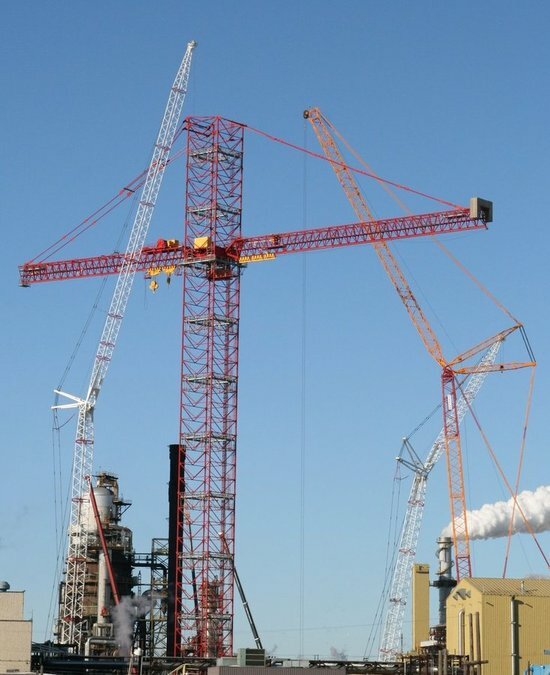 What Type of Cranes are Hired for Industrial Work? It is a single rail crane. It is used to transfer the material from one area to another. It has the capability to cover great distance in a short length of time. It can be attached with a roof structure or can be mounted through its own support or crane. It is helpful in transferring objects in a straight path. If the material is required to move from one part of site area to another, monorail is perfect to use. It is a kind of crane where jib or horizontal member is preset and gives support to portable hoist. It has a limited platform and has traditional structure. Now, the improved versions are used such as Articulated Jibs and Cathead Jibs. Cathead jibs can change retractable type of arms which are ideal to move in a fixed obstacle like building column. To provide extra movement, the jib can move to and fro by an arch. It has free to stand structure which has made it mobile crane. Jib crane is specially used for fix work when items are required to move from one spot to next. Mostly it is used for packing material, lifting a product, moving an item out of the machine or from a work bench. Jib cranes can mount equipments like hydraulic line tools and air tools. Jib cranes are suitable for small work site. If it is important to cover more distance, Gantry cranes or Monorail cranes are the right choice. It is a steel based crane and perfect for the movement of heavy load horizontally. It can bear 350 tons of weight. Overhead or suspended crane is different to Gantry crane as the trolley/hoist moves only. It is typically mounted along lofty columns. It holds hoist in unchanging machinery that moves horizontally beside the rails, often fitted on mono girder or twin girder. The frame of crane is sustained on gantry system along with wheels and equalized beam that move on gantry rail, mostly vertical to the travel track of trolley. Tower crane can be assembled to telescopic jib. The self erecting cranes are also included in tower cranes. These are capable to lift using jacks and best for telescopic use. No extra help is required for assembling these cranes. Crane is available in different types and each is tailored to perform specific function. Sometimes the small cranes are used within a workshop whereas the tallest cranes are used for construction. In order to make the work feasible, special construction cranes are used. The cranes are usually fixed in the ground to avoid imbalance. The cranes are stable in nature and have protective measures to save the workers. The cranes are useful to save the time and help workers in performing the hectic tasks. Liebherr unveiled at the ConExpo its 190 ton LTM 1160-5.2 five axle chassis mobile crane. The company has increased the load capacity to about 25%, of its new presentation compared to its predecessor, the LTM 1160-5.1. The newer version uses the same telescopic boom of 203 ft however has been reduced in width to 9’0” from its predecessor’s 9’10”. The reduced width now allows the mobile crane to move in constricted areas and drive on public roads as well. What makes the LTM 1160-5.2 stand out of the crowd is its superstructure which is superbly powered by only a single engine unlike other cranes of the class which come with twin engine concepts. The crane chassis on a single engine operates using a mechanical shaft. 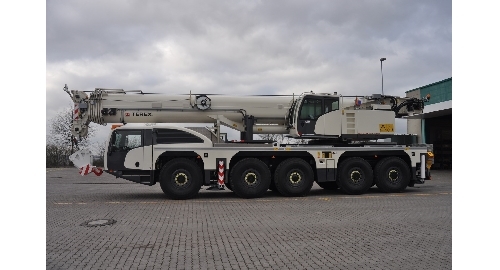 This mobile crane is Liebherr’s second crane model of five axle to be featured with a single engine, while the initial one was presented at the 2013 Bauma as LTM 1300-6.2. In the crane chassis the gear shaft routes from distributor gear, using gears of 2 meters that comes all the way through to the center of the pump distributor gear’s slewing ring. A six cylinder, Tier 4 final Liebherr engine stirs up 544 hp at a rpm of 1900 offering a 2,516 Nm torque at an rpm of 1350. The ZF-AS 12 speed Tronic gears are used to transfer power to the crane axles, while the zero wear hydrodynamic, intarder brakes perform as a retarder. The option of a current Telma Eddy brake is also available. The low speed of the engine in the chassis offer adequate crane work power while the mechanical shaft allows a high level of efficiency. The removal of the superstructure separate engine offers a provision of condensed maintenance weight and work. The reduced weight helps load bearing components which in return enhances the load capacity of the crane. The new add on program developed for the unique crane drive concept offers a single engine to cranes while the mechanical shaft option offers the possibility of running the machine on very low rates of fuel consumption. Not only does this allow the pump drive to be completely disconnected automatically whenever the engine is idle but also reconnects it through an intelligent controller whenever required within seconds only. Like most of the other mobile LTM crane models, the 1160-5.2 also features pneumatic disc brakes. The 190 ton rear axle model acquires electro hydraulic active steering based on the speed of the vehicle. This feature not only enhances the vehicle’s maneuverability but also decreases tire wear. The 5 programs of steering can be very conveniently selected at a simple touch of a button. With a maximum weight of 132,000 lbs and axle load of 26,200 lbs, the new LTM 1160-5.2 is ready to carry a three sheave hook block, its dual folding jib and storage box with a liberal payload. The new mobile crane also comes with a Liebherr LICCON2 crane control which offers the provisions of a cost effective and simple extension towards an absolute remote control crane system. What Are The Safety Measures For Operating EOT Crane? EOT Cranes play a vital role in the construction industry, shipyards, mining, construction, steel and transportation of heavy objects. Cranes are highly beneficial in different indoor and outdoor building activities. The industrialization is dependent on the use of EOT Cranes. It is required to get proper knowledge before using these cranes. Untrained and unskilled operators can become perilous for their lives and can smash up the expensive objects. Different types of safety measures are prescribed by American law to operate EOT Crane. The operators are required to follow the rules and regulations. It is compulsory to know that each and every crane has different system and operator must have guidance for the particular cranes. The operator has 6/6 eyesight according to the driver’s license. The drivers should not be handicapped and capable to move feet and hand properly. The law which was passed in 2010, states that the American health and safety organization OSHA has upgraded version of safety rules. The EOT Crane operator must have certificate from National Commission Certification of Crane Operation. The certificate gives guarantee that operators are well informed with the hazard and have potential to manage the routine tasks. As a result, accident will be prevented to an extent. It is significant that the heavy object should be assembled carefully. There should be no chances of crumple while assembling or installing the weighty objects. It is obligatory to inspect the cranes on regular basis. 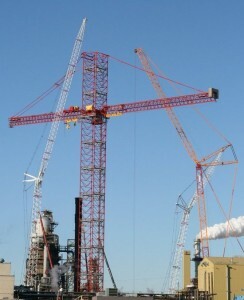 The cranes are required to be checked before and after the shift. The audible signs of alarms are necessary for EOT Crane. The workers should be dutiful and know the meanings of different signals. The cranes should be loaded according to its capacity. It is clear that the load which goes beyond the weight’s maximum value must be taken away. It is the duty of crane operator to check the path for the movement of crane and remove the obstacles. All these precautions are necessary to be taken before the movement of crane. The worker should get training concerning the emergency actions. They have been trained about mechanical or electrical failure. The workers have tight clothing s loose clothing can become a reason for an accident. When the crane is not in action, it should be parked in safe area without any load. Nobody should sit on the pulley or the hoist of the crane, because a slip can fall the worker and may lead to unexpected tragedy. In order to avoid accident, the workers should get training to lockout the crane. Broadly speaking, the workers should know the sign, alarms, labels and instructions. Each and every worker ought to be proficient, expert and tested before using the EOT Crane. When all the requirements are fulfilled, the operators are given a license to work on the crane. The information about EOT Crane are available on different sites, you can visit eotcranes.org and learn specific functions of cranes. Here you can find the latest models of EOT Cranes and authentic solutions for different issues. You would be enthralled to know that the largest and the biggest EOT crane in the world has arrived. And weighs around 20,000 metric tons that mean it is worth 98 statues of liberty. Wow, that dos sound quite awesome. However, the fact is that the world of trade and commerce require quite large vessels these days, which is why the crane needs to have muscle which is worth every ounce of steel. The world has finally seen the biggest crane, known as Taisun. It has been able to set a world record, for it can lift up to 20,133 metric tons. 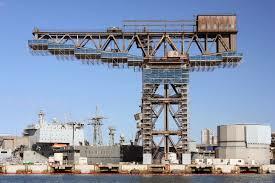 It is a Gantry Crane, which has a dual-beam and is made up of mega proportions. You might be wondering as to how this crane came about and of course, what was the need of such a huge crane? 10 years ago, a company known as Yantai Raffles Shipyard located in the Shandong Province of Chin decided that they would be building huge and big offshore oil vessels, which would obviously require machinery which would be of a huge size. Therefore, they decided the world’s largest crane had to be invented, if they wanted to take the maximum benefit of such a huge vessel. And this dream has finally come true in the form of Taisun, which is state-of-the art machinery because of its towering state and gigantic proportions. 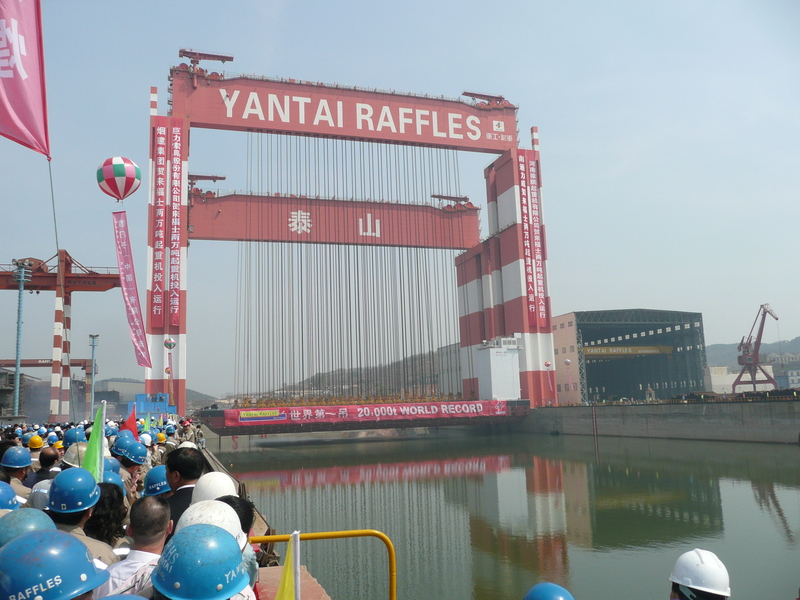 This came about in 2009 when the Yantai Raffle Shipyards were able to do that. This machinery was named after the famous sacred mountain located in the province of China, which is a symbol of the strength, the size and the amazing qualities of the mountain, and hence reflecting such an image upon the crane. This amazing crane was christened on April 18, 2009 and the event had guests numbering up to 600 guests from all over the globe. The ribbon-cutting ceremony was performed by highly distinguished guests. 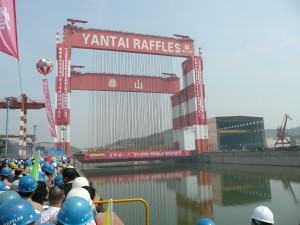 The Chairman of Yantai Raffle Shipyards was able to demonstrate the sheer strength and size of the EOT Crane by hoisting up a launching barge around 30 metres above the water. The Witness Load Testing was presented to Mr. Chang by the American Bureau of Shipping. This was done because this had definitely proved the record of heavy lift which had been spoken off by the YRS. According to a representative of YRS, there is no doubt that the way offshore projects are handled at this moment would be revolutionized through this crane. The hours that would be spent working would be highly decreased, which would mean a cost-effective way of joining sections which are up to 20,000 meter tone. In addition, the crane is highly safe and easy to control. There is perhaps no doubt that the introduction of the biggest EOT Crane in the world would lead to even better project execution. People have been dying to see the working and the efficiency of this crane. There is much speculation about whether it would be a success.